The B. Braun ULTRASITE Luer Access Device is a needle free closed system that connects to the I.V catheter to prevent blood drawbacks when infusing fluids and medications. The device also prevents catheter occlusions to maintain a high flow of fluid delivery. It's compatible with pre-filled medication systems using a quick Luer Lok connection to prevent needle access as a sure way to reduce accidental needlestick injuries and touch contamination. The Luer Lock is also easy to clean and disinfect. 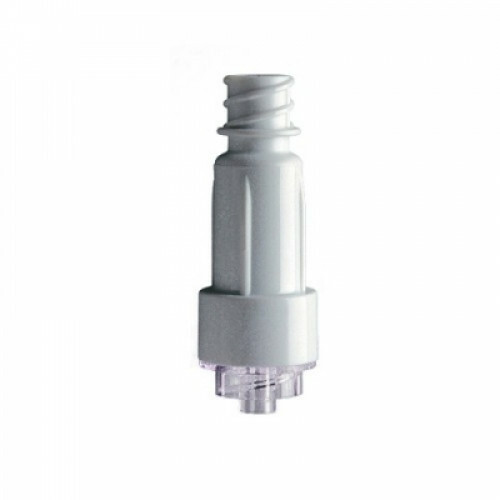 The B. Braun 415110 ULTRASITE Needle Free Luer Access Device is available for purchase as a single sterile device or in a case of 100. You may also want to consider Introcan Safety IV Catheters, by B. Braun, that are made of polyurethane for a flexible and softer in-dwelling. This is what the hospital put on the end of my Power PICC Solo 2 catheter, and I'm glad I found them here. I didn't know I had to replace the catheter adapter every week until the Dr. told me after the PICC line was placed; I was grateful for Vitality's quick shipping as I received them before my next dressing change! The only thing I would ask Vitality is to put more pictures and more detailed product descriptions on their website; I'm not a medical professional, just a patient and my Dr's prescription doesn't really specify brands etc. just stuff like 'catheter adaptor, IV administration set, IV extension', it gets frustrating when there aren't any good pictures for reference (as in this product listing) now that I'm getting used to giving myself infusions I'm developing preferences in my supplies, but I wish this 'world' was easier to navigate.